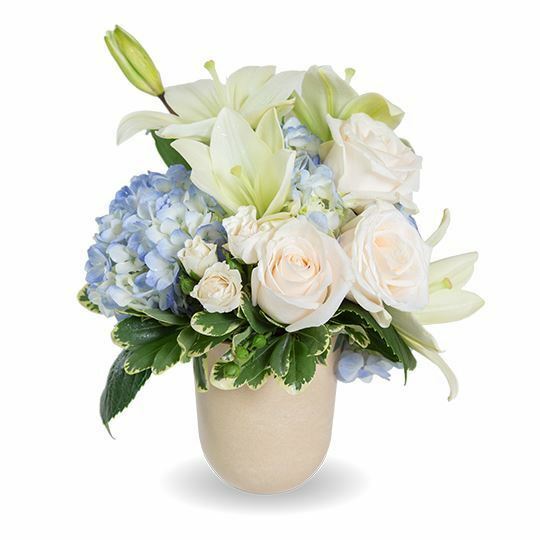 This soft arrangement of ivory roses and lilies nestled between cloud-like blossoms of blue hydrangeas brings back memories of summer days and blue skies. Very happy with the way this turned out! This looked amazing, thank you so much for delivering so quickly! What a wonderful way to send your condolences. The perfect size and the perfect flowers! These were so easy to order and they arrived looking amazing. I would absolutely order from here again! I am very happy with the way these turned out, they looked just like they do in the picture. 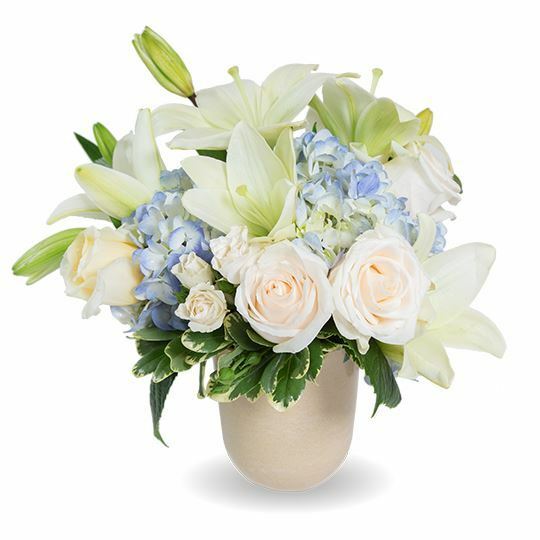 I love the pastel colors of this arrangement, they are really peaceful. What a wonderful way to remember someone! I was so thrilled when I saw these in person!! Thank you!! I would definitely recommend ordering from this site! They are so helpful! I could tell that the florist put a lot of thought and love into this arrangement. Thank you. I was very impressed with how fresh and wonderfully fragrant these flowers were. Plus they looked great! I have never been more impressed with an arrangement than I was when this one arrived! It was pretty hard to decide since this site has a lot of option for these smaller bouquets, but this one was perfect for us. They were worth every penny. These were very comforting to have in a very trying time. The picture really doesn't do these any justice! 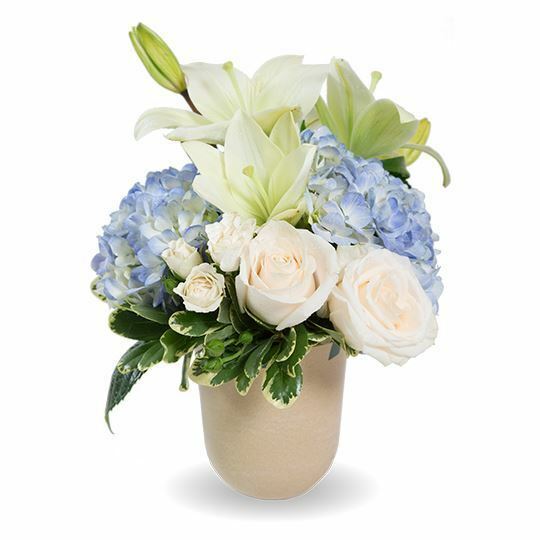 The blue hydrangeas were my favorite part of this arrangement, but everything was beautiful! Would definitely order from this site again, but I really hope I don't have to any time soon. If you are thinking of buying from here I would recommend it. Easy to order, and even easier to look at! What a beautiful and classy arrangement this was! They were a little smaller than some of the other arrangements but so beautiful that I couldn't pass them up. So glad I ordered two of these! One would not have been enough with how pretty these were! I am very impressed and happy with my order! Super pretty and smelled great!